I’ve attached a screenshot of the votes in the jump below and you can see the actual votes here as well but guess what happened. 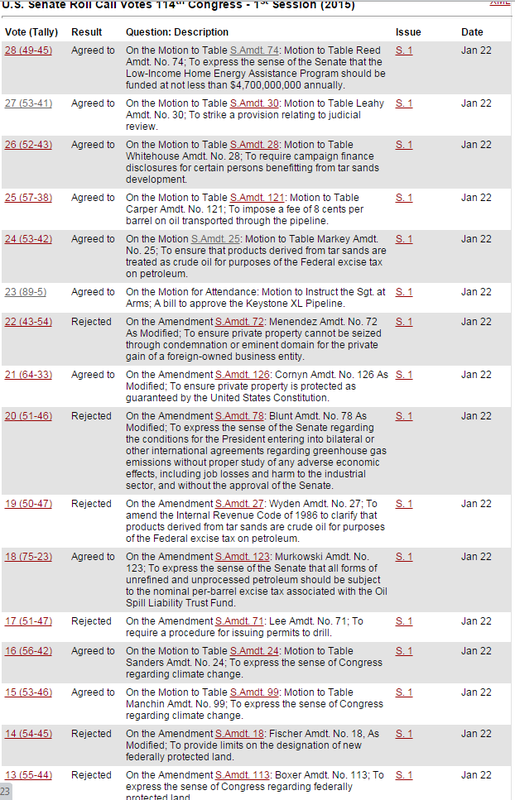 Hardly any of the amendments offered by Senate Democrats actually got a vote. Instead, Senate Republicans voted to table most of them, which effectively removed the amendments from consideration. While it is not the same as filling the amendment tree to prevent minority members from offering amendments, a favored tactic of Harry Reid when he was Majority Leader, it has the same result. For instance, we’ll never get to know who would have voted against the Sanders amendment to recognize global warming as human made. In the original blog post, I argued that the responsible thing for Senate Majority Leader McConnell to do for his party was to prevent votes on minority offered amendments. I stand by that. McConnell took steps to protect his members from having to take potentially embarrassing votes which is among his primary duties as a party leader. Whether or not he did the responsible thing policy wise is a different question.